This is a guest post by Richard Johnson, head of sport at Social Chain. I don’t think there are any more words which can describe this World Cup so far, one of the most exciting of recent history, spearheaded by VAR controversy, giant killings and of course here in the UK, England’s heroics which has instilled some national pride against all the odds. As the most social of World Cup’s yet, I wanted to take a look at the “It’s Coming Home’ phenomenon and how it’s taken over our timelines for the past three weeks. If only we were able to take Twitter back to 1996 to see what the impact of Three Lions would have been when first released, and how quickly it would have been made into a meme. But, what we can look at is when people have been jumping on this bandwagon. The first wave of activity was very small (barely measuring on the chart), on the first day of the World Cup as Russia and Saudi Arabia kicked off, it seems at this point, after all the negative press attention before the tournament and lack of expectation, World Cup fever finally hit, albeit it only spread in a small way compared to what was to come. Not surprisingly, we see huge peaks on the days of the first two England matches, the first two games peak at 38k and 35k uses of #Itscominghome or #footballscominghome! But what I really love here is how England fans actually go quiet the night before the game! I think that gives us an interesting insight into us England fans – are we preparing for failure, afraid to jinx it, or even don’t want those tweets haunting us should we lose. I would love to see a brand bold enough to activate at these moments, capitalising on the pessimism of fans – could incentives be offered to go all out at these points? We can see how the movement has grown dramatically in the past week around the Sweden game, where the hashtags were used 325k times, an 800% increase as fans begin to believe! Looking into the demographics of fans using the hashtag, the results can tell quite a story. Considering Twitter is not considered a primary platform for 17 or below, we see this age group get behind the team in a big way, just below the 35 + category who clearly have a huge sense of national pride, whilst it massively dips for 18-24 and 25-34. Why does it drop so much for the 25-34 age group? 30 years of hurt perhaps lingering in close memory which has beaten fans into a heightened state of pessimism? Myself and my mates fall into that bracket, but we have made that mistake too many times to jump of the hype train only to be delivered heartache time and time again. Perhaps the ‘underdog’ status of this social-boom generation of players, have developed the strongest relationships with football obsessed teens due to their approach, reliability and comfortability to push back against press criticism. The fact under 17’s haven’t been exposed to false promises of a ‘Golden Generation’ but instead can find relatable aspects with the current crop have provided them with enough belief and enthusiasm to back them more than any other demographic. 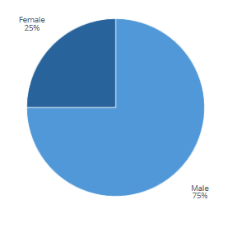 We can see from the first chart below, the gender breakdown of #Itscominghome posts within the first two weeks of the tournament. We can see a rise of 6% for the female voice around #Itscominghome three weeks into the tournament, showing more women being more vocal in supporting the team. Clearly this insight is not based on a pure reaction from English female fans excitement in the past three weeks, however this should provide real direction for advertisers to ensure a more bespoke approach to this growing audience. Who is bringing it home? The Winners and Losers? Naturally William Hill, paying for the hashtag for three weeks, should be the happiest, but looking at the top mentions within uses of the hashtag, we don’t seem to see the association with William Hill tracking. If anything we have seen some public backlash against William Hill with the public accusing them of hijacking celebrations as highlighted by Campaign Live. Spotify must be pretty pleased with how things have gone, again further evidencing their ability to fuse data with great content stories and cultural moments is a winner! Aside from other brands trying to integrate themselves into the hype, I think what I have enjoyed most is some of the fun, viral fan produced content, which really have given the country a feel that everyone can be part of the moment. ???? #ThreeLions has officially been named No.1 in the United Kingdom charts. As we drive head on into the semi-final let’s not expect this wave of national pride to subside, and for me, that is no problem! I’ve no doubt agencies and Brand Managers across the country are now pulling together the plans around “Ok so what do we do when it actually comes home?” (I know we certainly are! ), and I’m excited to see some of the fantastic brand executions to build on this sense of unity! Let me know your thoughts. Has a particular brand benefitted the most? What has been your favourite meme? Is It Coming Home?